(1) Editorial: Do you have a silver nitrate story?- It happened again. Yet another IC patient contacted our office after being treated with an outdated therapy, silver nitrate, that damaged their bladders. Why physicians are continuing to use this archaic treatment despite any evidence showing effectiveness against IC is baffling. We're collecting more silver nitrate stories from patients in our quest to ask the AUA to issue a statement about its inappropriate use. (2) Children with IC: An Interview With Dr. Robert Evans- When Jill van Royen sought medical care for her young daughter with IC, she found little help among the physicians in Northern California. Out of desperation, she and her daughter flew across the country to see Dr. Robert Evans at Wake Forest University (NC). 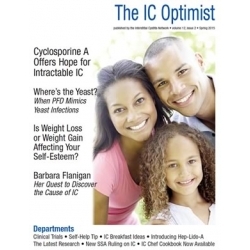 It was there that she finally found a physician experienced in treating IC in children. Ms. van Royen wanted to use IC Awareness Month as a platform to educate other parents about the needs of children with IC. 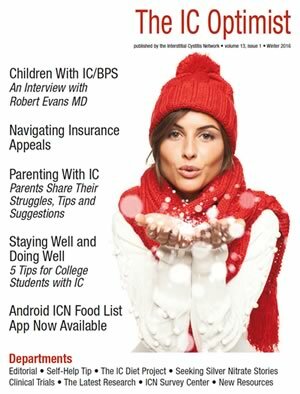 In this issue, we feature her interview with Dr. Evans and a proposed four step pediatric treatment plan. (3) New Resource: Android ICN Food List App Now Available - We're delighted to announce that the long awaited Android version of the ICN Food List App is now available for purchase in the Google Play Store for just $1.99. This is the sister App to our iPhone/iPad device launched two years ago. (4) Feature Story: Parenting With IC - IC patient Vanessa Symonette has the right attitude about parenting with IC. She says "I refuse to let this disease take away my active role as a mother. I will always be the best I can be for my daughters sake." IC writer Stacey Shannon shares several parent stories, tips and, most of all, suggestions. (5) ICN Survey Center: Did your IC begin after a traumatic event? 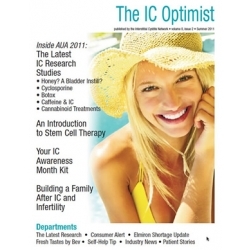 - Did your IC symptoms begin after a specific event, often childbirth, a serious UTI, chemo therapy, a fall or car accident? We'd like to know what triggered, if anything, your IC symptoms in a new ICN Survey! (6) New Resource: 'Healing Pain "Down There"' - Dr. Robert Echenberg and colleagues have released a comprehensive new DVD series, 'Healing Pain "Down There"' for women with pelvic pain. This groundbreaking educates the patient and provides essential tools that will help them find relief. If you've struggled with chronic pelvic pain (and PFD) and have not responded to therapy, these DVD's could help! (7) Clinical Trial News - Three new clinical trials are currently seeking participants! (8) The Latest Research: Seven New Studies - Ever wonder how many surgeries are necessary for patients whotry Interstim? Dr. Ken Peters shares results from his clinic showing that additional surgeries are often necessary. (9) Persistence and Education Key For Navigating Insurance Appeals - Dr. Jeffrey Proctor shares his tips for fighting back when insurance companies deny coverage for compounded medications like the most popular IC instillation, Hep-Lido-A. 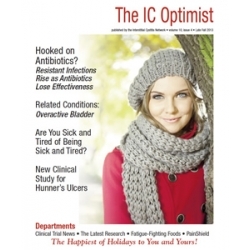 (10) Feature Story: 5 Tips For College Students with IC - Maggie Damken wants to encourage other IC patients to continue their education. In her IC Awareness Month Project, she shares several excellent tips for patients contemplating a return to college that will make the experience much more comfortable and supportive! Did you know, for example, that every college has an Office of Disability Services that helps students with disabilities? They can be incredibly helpful! (11) Self-Help Tip: Why Stepping Away From It All is Sometimes the Only Way to Heal From Within - IC activist and support group leader Tali Keteri shares a brutally honest article about why she had to step away from our advocacy efforts to help regain her joy in life. It's a lesson for every IC group leader and volunteer! Your heart and soul must come first. (12) The IC Diet Project : A Traditional Holiday Meal - IC authors Bev Laumann and Jill Osborne share four of their favorite and bladder friendly holiday and/or special occasion recipes!